Swiftcurrent Pass makes for a big, fantastic, hiking day no matter which route you decide to take. 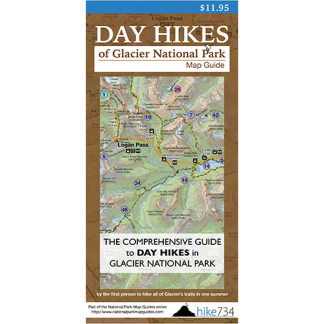 The most popular route takes the Highline Trail from Logan Pass to Granite Park Chalet, then over the pass to Many Glacier, which is the route described here. Start at Logan Pass and hike 7.4 miles to Granite Park Chalet (For the description of the trail from Logan Pass to Granite Park, see the Highline Trail in the 10-15 mile section). From Granite Park Chalet, hike 0.7 miles up to Swiftcurrent Pass. 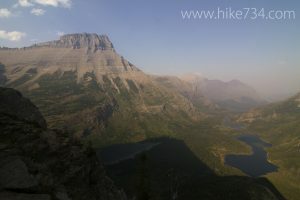 If you have the energy, a side trip up to Swiftcurrent Lookout is amazing, but adds 2.7 miles and over 1,200 feet in elevation gain round trip to an already big day. From Swiftcurrent Pass, you will descend through alpine areas, then rocky cliffs with waterfalls, until you get back down into vegetation with a wonderful overlook of the valley below. Look carefully in and around Bullhead Lake for moose, and watch in the summer months for wild huckleberries as well. At approximately 3 miles down from the pass, you will reach the valley floor and pass a chain of lakes in the Swiftcurrent Valley. The peaks that you were at eye level with at the start of your trip now tower above you as you go from meadow to meadow. Next you will come to Redrock Falls, which is a nice place to relax before you go around Redrock Lake and then pass Fishercap Lake to Many Glacier. Trailhead: Located across Going-to-the-Sun Road from the Logan Pass Visitor Center parking lot. Alternatively start at the Loop for a shorter day with more elevation change.